"To be the premier farm to table dining experience in southern California..."
"Farm-to-table," "local," "sustainable" - so many buzzwords have been floating around these past few years to attract people to restaurants but how many places can stand behind these marketing terms so proudly as Oceans & Earth in Yorba Linda who grows their own produce? That's right. The restaurant with the weekly changing menu helmed by Chef/Owner Adam Navidi of Future Foods Farms boasts not only an organic, from-scratch, and completely gluten-free menu but also the fact that they source a majority of their ingredients from themselves. I joined a few other people on a tour of Chef Navidi's impressive, expansive 65-acre farm in Brea before sitting down to enjoy a wine-paired multicourse dinner curated by General Manager/Owner Barbara (Barbie) Wheatley. In addition to their dedicated farming practice being impressive, the food was simply brilliant and ostensibly inspired. "Every season has its reason." 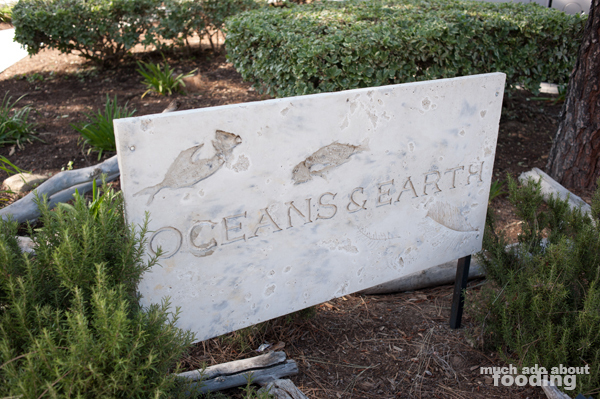 Opened less than two years ago, Oceans & Earth set down its roots with sustainability in mind and a conscious consideration for the community it would serve. From the start, they have committed to being a gluten-free facility because as Chef Navidi puts it, "just one molecule of gluten will make a person with celiac disease really ill and we don't want to take that chance." That perspective aligned with the restaurant's pursuit of making everything from scratch - that includes the bread that they bake daily in-house. With that in mind, because they source from their own farm, the restaurant sees new dishes on its menu on a weekly basis which certainly keeps the staff on its toes! In addition to the conscience the owners share about their ingredients, there is also a focus on other parts of the restaurant. 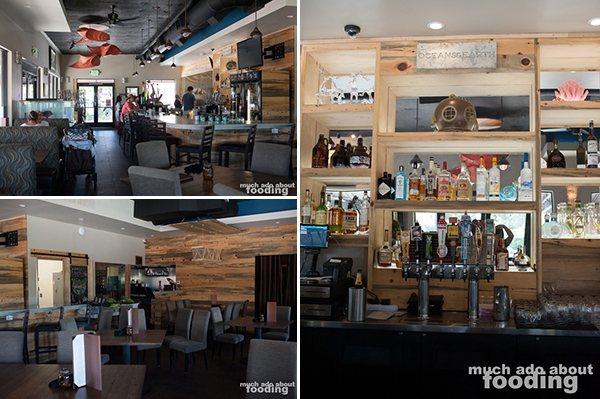 Take, for example, the slats of reclaimed wood that a large part of the restaurant showcases from the walls to the bar. "We have to have more people passionate about farming and where their food comes from. For our farm, it's farming as close to nature as possible, food safety at its best." It was apparent that Chef Navidi pays close attention to those supplies of his that aren't grown by his own hands, and this particular scrutiny of product quality reflects in the food. When Future Foods Farm was home to 150 beehives (now down to five as the majority have been relocated) maintained by Guerilla Beekeepers, prime honey would ooze from the menu alongside purchasable jars at the front. Olive oils and vinegars are sourced from the chef's own brother, Ken, who imports from Italy and manages Navidi's Olive Oils & Vinegars in Camas, WA. Oceans & Earth doesn't feature a lot of tuna nor sushi due to threats of lead levels and overfishing but they do have an intimate relationship with dorymen out of Newport Beach who give them regular updates while out fishing. 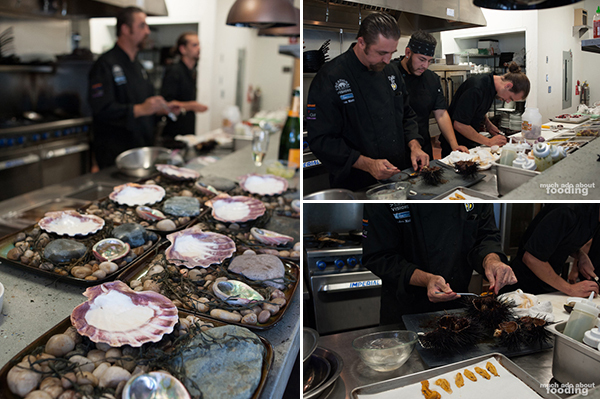 Partnerships with Carlsbad Farms in the past have provided quality shellfish and the current one with Catalina Offshore lined our plates with beautiful scallops and urchins. The intense operations being done out at Future Foods Farm is beyond impressive. It has the strong potential of being revolutionary because many of the methods and structures have been created by Chef Navidi himself. Thousands of heads of lettuce can be grown with as little as one gallon of water used per head throughout its life cycle. 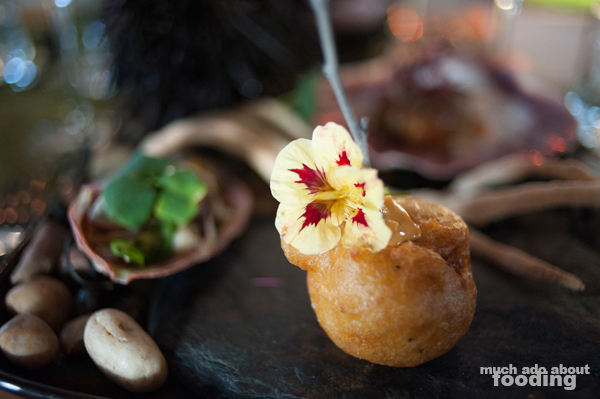 Wild plants are used to their fullest, and all of these factors coalesce in the end to make imaginative dishes that we got to try out firsthand. Our dinner began with an ever-changing plate that Chef Navidi creates often for special occasions called the "Tasting of Tides" which panels several different seafoods onto one beautifully arranged plate. In this case, alongside a glass of Decoy Sauvignon Blanc, we enjoyed Future Foods Farm Tilapia & Ocean Rose Abalone Ceviche with Greenhouse Tomatoes and Wild Clover; Crab Croquettes with Alder Wood and Nastrutium Aioli; Seared Sea Scallop with Seaweed and Orange Ginger Reduction; Tidepool Sea Urchin with Stinging Nettle, Hope Ranch Mussels Seaweed, Mugwort Stock, and Lobster; and House Gluten-Free Brioche. What a mouthful of a description! The ceviche was incredibly fresh and full of life, portioned to just the right amount for a taste not disruptive in size. We all really loved the crab croquettes which featured the lively flavors of fresh crab encased in a gluten-free batter. Personally, the sea scallop was my absolute favorite for its perfect doneness and the slight touch of chili on its seared crust. Creatively, however, I really appreciated the thought and effort that went into making the "tidepool" within the sea urchin shell which featured a light but weighty broth. It tasted especially great once you dipped in the breadstick which had been formed with plenty of rosemary and oregano for aromatics. The second course was called Future Foods Farm Salad in Backyard Grapefruit featuring baby butter lettuce, avocado, saffron shrimp, and shrimp chicharron. The last component had my eyebrow raised upon first read but once it came out, it was blatantly obvious - the shrimp shell had been worked with to be a crunchy "chicharron," a use that Chef Navidi wanted to put shells to outside of the typical shrimp stock build. 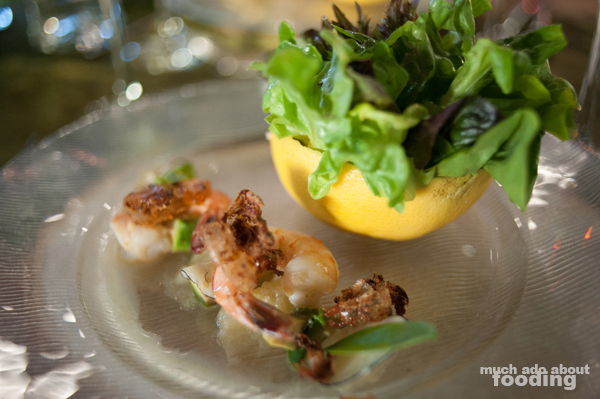 The saffron shrimp we had was poached in a broth made of grapefruit juice, avocado oil, garlic, and shallots which all combined to make a brilliant flavor for each bite. With a bit of that broth on the baby lettuce, we were able to savor every bit of the process and it was neat to see how this salad was presented. Where'd that grapefruit come from? Naturally Chef Navidi has his own orchard at home, of course. 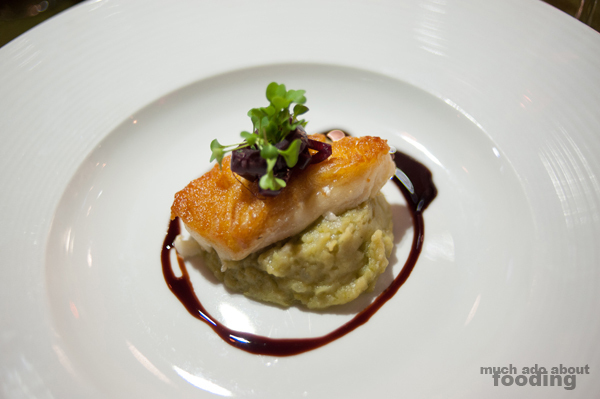 The next course was one that Oceans & Earth absolutely cannot remove from their menu due to their customers - Pan-Seared MSC Chilean Sea Bass with greenhouse basil mashed potatoes, caramelized shallots, micro arugula and a red wine reduction. Just a handful of items on the plate is enough to make others come back for more, and aside from its simplicity, I truly understood why. Melt-in-your-mouth tender, the bass had the perfect sear on it, and I could not keep away from the basil mash which was one of my favorite bites of the night. "I know the future of food - use everything." 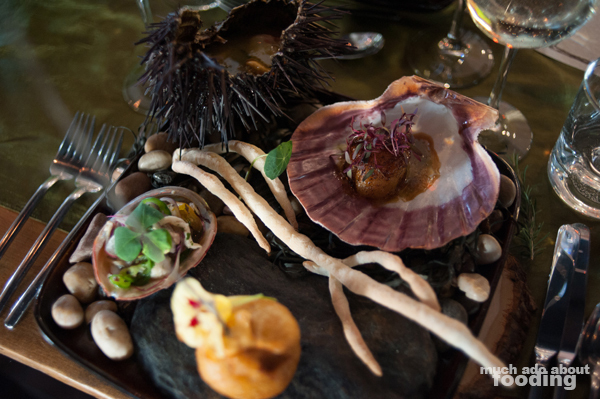 The seafood was followed quickly by a dish called "Duck Over Wild Mustard Fields" that contained duck confit leg and breast, duck blood pate, and a fig glaze. Inspired by the Van Gogh painting "Crows Over a Wheatfield" which had broad finger strokes, Chef Navidi pureed and spread wild mustard across the plate in messy dabs to mimic the style. It makes sense why there would be so much of it everywhere - the weed itself covers plenty of ground on the farm! 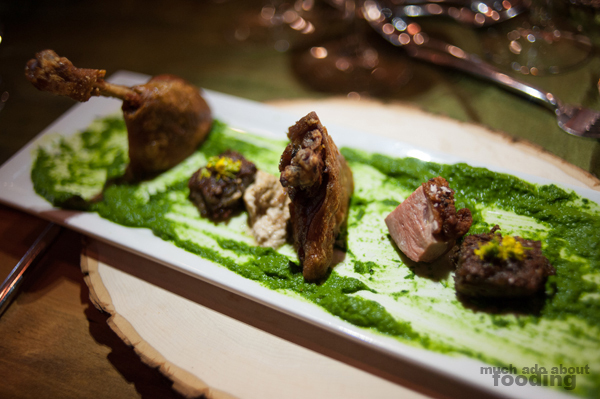 Here, the wild mustard puree served as a lovely contrast to the crisp skin on the duck. It remedied the saltiness from the leg and breast a tad as well, and the duck blood pate was similar to a foie gras mousse in its fatty smoothness. The group seemed excited about our following course - the Evolution Burger made of grassfed bison, aged Cheddar, tomato, onion and lettuce wrapped in a gluten-free brioche and paired with truffle BBQ sauce. What was unique about this burger was its presentation. Instead of the typical patty between buns, this burger was seemingly all bun until you bit into it. Take everything you put in a burger and literally put it as a meatball into the bun; upon baking, everything steams inside and keeps the natural juices inside. Once you bite into it, there is a near-perfect even layer of brioche all around the filling. It was brilliantly done and well-executed, a more bread-forward version of a beef wellington in my mind. 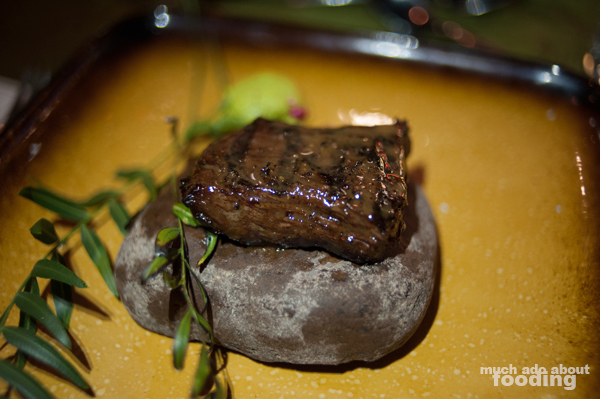 The next up was their Hot Rock, a skirt steak dish featuring avocado chimichurri and telicherry pink peppercorns grown at the farm. Chef Navidi suggested we cut across the grain for the most tender slice, and after following his lead, we all commented loudly to one another just how tender it was. The avocado chimichurri was a spiced, delicious surprise that I could have easily all on its own. Now, all of this so far has been very meat-heavy but Oceans & Earth also prides itself in providing plenty of delicious vegetarian/vegan options such as their veggie burger made out of several ingredients including seaweed, quinoa, tumbleweed, chard, rice, caramelized onion, cauliflower, etc. There is also a cauliflower steak to pique your interest if you're seeking those kind of dishes! 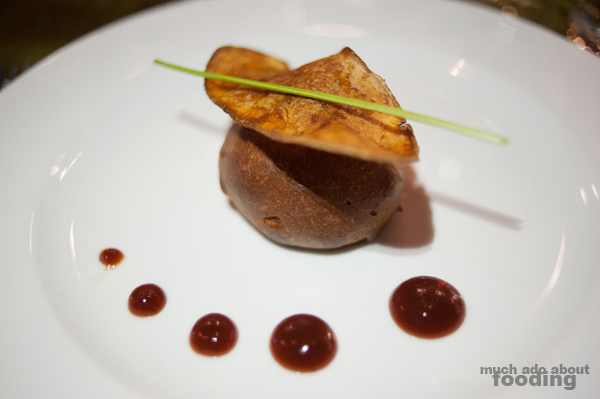 We finished the evening with what Chef Navidi called "My Love for Madelines" paired with Porto Kopke 10 Year Old Tawny. 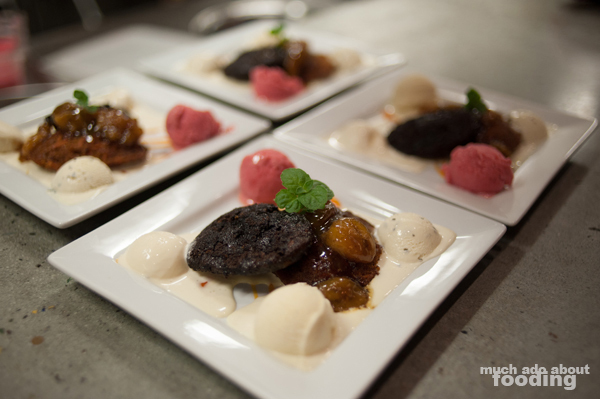 Seems like our chef has a sweet tooth! These madelines were separated into two flavors and flanked on all sides by ice creams made in-house. One was a cayenne ginger carrot cake style while the other was chocolate bananas foster - yum. Our miniature scoops of ice cream were their vanilla ice cream, strawberry frozen yogurt, cardamom ice cream, and rosemary ice cream. Fluffy but dense with flavor, the madelines were consumed quickly, and my oh my was the ice cream delicious. I had a strong favorite in the rosemary one; how often would you see an herb used so? "There's no better teaching than having someone eat something that they grew themselves." Overall, what a fun dinner at Oceans & Earth and what a genuinely impressive showcase of what their menu could offer. 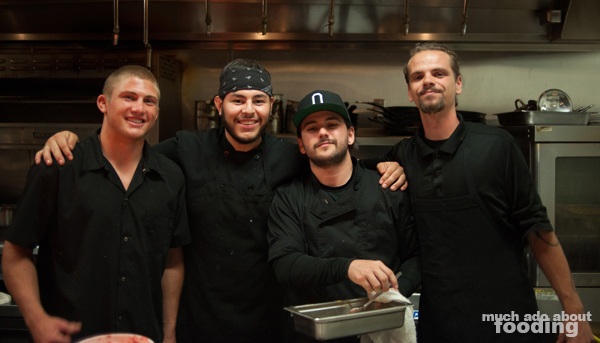 The other chefs on premise that evening was also a group of congenial young men who seemed vested in the restaurant's direction and aspirations. When asked what was coming next, Chef Navidi shared his vision for building a fully automated greenhouse on the side of the restaurant that would allow for interaction with the guests, especially children who would be able to plant a seed with their name affixed to the plug and watch it grow every time they returned for a visit. Ultimately, he hopes to make this system commercially viable and distributed to elementary schools for both education and better eating habits. We say, DO IT! We need more pioneers like Chef Navidi out there. 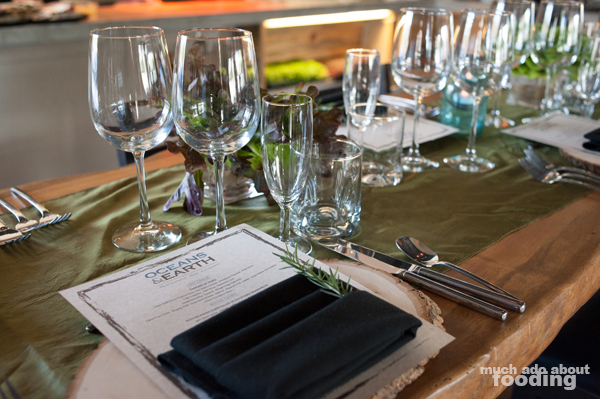 If you want to truly have that farm-to-table experience everyone has been seeking in their food, find Oceans & Earth at 20305 Yorba Linda Road, CA 92886 and make sure to learn more about the projects that Future Foods Farm is heading. Their one-of-a-kind aquaponic system is just fascinating and may very well be the future of food. At least, it should be.